Since the mid-1990s, Singapore’s students have ranked at the top of international comparisons of mathematics scores on exams such as the TIMSS and PISA. Given this success, many U.S. schools have sought to implement Singapore’s model of math instruction, which focuses on developing a deep understanding of numbers and concepts. To support these efforts, Houghton Mifflin Harcourt worked with Marshall Cavendish, the publisher of Singapore’s leading math textbooks, to produce a Singapore math program tailored for U.S. schools and students. 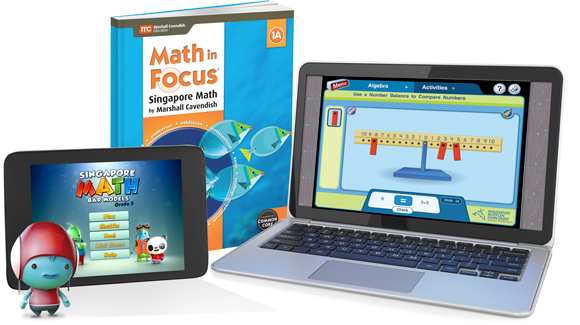 The resulting product, Math in Focus: Singapore Math by Marshall Cavendish, is a comprehensive K-8 mathematics curriculum that was first introduced to U.S. markets in 2007. At the request of our subscribers, Learning List reviewed Math in Focus (MiF) in the spring of 2014. Our review found that mathematical reasoning and problem solving are the primary focus of the program’s approach to instruction. MiF addresses fewer topics at each grade level, but explores these topics in greater depth. Its content is highly visual and sequenced to support students’ progression from concrete to pictorial to abstract understanding of math concepts. In addition, MiF incorporates models to help students visualize complex problems and develop strategies for solutions. Students are asked to explain and critique their solutions as well as those of their peers using mathematical language. Across grades, instruction focuses on developing students’ ability to use models, reason mathematically, and communicate their reasoning in precise language. Educators who provided feedback for our review stressed the importance of professional development to implementing MiF successfully, noting that the curriculum marked a shift in pedagogy as well as in materials. At the elementary level, they said that teachers needed training in the program’s more rigorous content and the use of higher order questioning strategies. At the middle school level, they said that teachers needed support with the transition to a more student-centered approach of math instruction. MiF includes extensive resources to support the implementation of the Singapore system. Teacher editions include background information on unfamiliar strategies and models and online tools include chapter-specific professional development videos and podcasts in which authors provide information about MiF’s content and pedagogical approach. MiF includes comprehensive support for the Common Core State Standards and provides world-class instruction that meets the needs of U.S. students.